Cynthia Erivo can do it all. In the last year, she's won a Tony, run a marathon, nabbed a starring role in a Harriet Tubman biopic, and (as of last night) performed at the Grammy Awards. 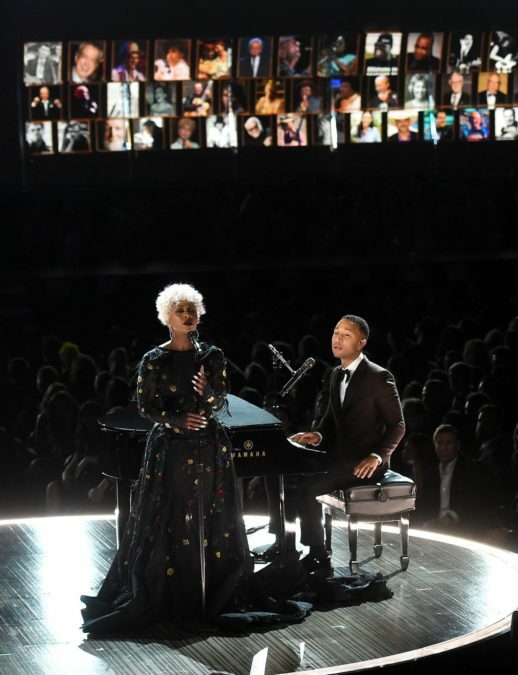 Hours after The Color Purple earned the award for Best Musical Theater Album, the wonder woman took the stage with fellow Grammy winner John Legend to perform the Beach Boys' "God Only Knows" during the In Memoriam segment. The hair, the dress, the voice: she's beautiful, and she's here to stay. Hear the full track of "God Only Knows" below! Did you see The Color Purple company accept their Grammy? You can watch their acceptance speech (as well as Danielle Brooks and Jennifer Hudson's reactions) below! So I'm bringing home a new baby, her name is Grammy. She was born 2/12/17 approximately 5lbs 4oz and I can't wait to see her in person! @bwaycolorpurple We did it ya'll!! Thanks to everyone who believed that I could bring Sofia to life, @Oprah , Scott, Telsey and team, Jill, Allison, Brian, all the producers, Jason, the band, and John Doyle!! Thank you! !